In many ways, the best gaming PCs are only as good as the monitor attached to them. You can spend heaps of cash on a top-end graphics card, but if it’s hooked up to a decrepit monitor that can only handle lower resolutions, all that power (and money) will go to waste. That’s unlikely to happen with the AOC Agon AG352UCG, a feature-rich gaming monitor that promises to give you an immersive and silky-smooth gaming experience. A recent entrant in AOC’s gaming-orientated Agon line of monitors, the AG352UCG is a mighty 35-inch monitor with a 21:9 ultra-wide aspect ratio. And, it’s one of the best gaming monitors you can buy in 2018. You shouldn’t be too surprised to learn that such a large – and feature-packed – gaming monitor comes with a high price tag. It’s priced at £799 ($899), with Australian price and availability yet to be confirmed. It’s certainly not a cheap monitor, but when you compare it to some of its fellow ultra-wide competitors, such as the Acer Predator X34, which offers very similar features for $999 (£899, AU$1,899), it’s not too bad of a deal. The more business-orientated Philips Brilliance BDM3490UC comes in lower at £670 (around $960, AU$1,350), but you’re sacrificing size (it’s 27-inch rather than 35-inch) as well as some of the gaming-focused features like G-Sync. If you’re planning on buying any ultra-wide monitor, you’re going to paying quite a bit of cash, and the AOC Agon AG352UCG gaming monitor sits around the upper middle range of what you’d expect to pay. If you were already looking at the Acer Predator X34, then the AG352UCG is a very compelling alternative, for less money. An ultra-wide 35-inch monitor is inevitably going to be a large beast that will dominate any desk it’s placed on – this is a monitor that’s going to take up a lot of space, with dimensions of 847 x 587 x 266.45mm. However, as soon as you plug it in and start playing games, any concerns over size fade away. With the stand attached (you need to screw it in yourself), you can tilt, swivel and adjust the height to make the screen comfortable to use. You can also wall-mount it using a Vesa 100x100 attachment. AOC isn't going for a slim and modest look for this monitor, and the bezel that surrounds the screen is quite thick, especially at the bottom, which further increases the footprint; it does house built-in speakers, though, which justify some of the size of the bezel. As you’d expect from a gaming monitor the design is certainly striking, and although it's not as aggressive as the design of the Acer Predator X34, it helps the monitor stand out (as if this huge monitor needed any more help with that). The front of the AOC Agon AG352UCG is finished in black, with the ‘Agon’ logo front and center. There are also two long LED strips along the bottom that can display green, red or blue depending on your preference. The brightness of these LEDs can be changed using the on-screen menu, and they can be turned off as well. The effect is quite nice, although it’s a shame it’s limited to the three colors, which limits customization. The LEDs also reach around to the back of the monitor, which has a plastic black and silver design. The overall design is pretty nice, and won’t look out of place next to many people’s rigs. It’s also not as in-your-face as some gaming peripheral designs, so it won’t stick out like a sore thumb if you’re using it in more straight-laced environments. Around the back of the monitor is an HDMI port, a DisplayPort and four USB 3.0 ports, along with audio out. This isn’t the widest selection of inputs, but when you’re playing games at 3440 x 1440, a DisplayPort is all you really need. We've mentioned just how large the AOC Agon AG352UCG gaming monitor is. If you’re sitting close enough it can fill most of your field of vision, and with the help of the curved design it creates in a pretty immersive experience. If you’re worried that the short and wide aspect ratio of the AOC Agon AG352UCG will lead to a cramped workspace, fear not, as the 3440 x 1440 resolution is high enough to leave you plenty of desktop real estate. It’s also high enough to provide stunning graphics, while not being quite as taxing on your hardware as a 4K (3840 x 2160) monitor. If you’re moving from a 16:9 (the more common aspect ratio) 1080p screen, you’re going to be blown away. And that’s before we’ve mentioned that this monitor is G-Sync compatible. This is an adaptive sync technology created by Nvidia that eliminates screen tearing (an annoying visual glitch) and allows higher refresh rates of up to 240Hz for smooth-feeling gameplay. By supporting G-Sync, the AOC Agon AG352UCG joins the likes of the Asus MG248Q, Asus ROG Swift PG248Q and AOC Agon AG271QG. For many gamers, the inclusion of G-Sync makes any monitor a very tempting purchase. Combine this with the large size, high resolution and ultra-wide aspect ratio, and the AOC Agon AG352UCG ticks many of the boxes required of a formidable gaming monitor. It’s worth noting, however, that the maximum refresh rate of the AOC Agon AG352UCG is 100hz – so not quite as high as G-Sync allows, although it’s the same as its closest rival, the Acer Predator X34. Other features include built-in stereo speakers, 2000:1 contrast ratio, 100% sRGB color gamut support and a 4ms response time. A large range of settings can be accessed via an on-screen menu, which is controlled by a toggle located on the underside of the bezel. The on-screen menus of monitors are usually pretty fiddly to navigate, but this one works quite well, and you can easily cycle through the various options. The AOC Agon AG352UCG is certainly feature-packed on paper, so we were excited to test it out. However, first we needed to give the monitor a slight calibration, as the default settings were a little too bright for our liking. It only took a few minutes, however, thanks to the on-screen controls. We then gave the monitor a spin with the excellent Battlefield 1. This is a hectic multiplayer game that really benefits from a good monitor, and the AOC Agon AG352UCG delivers in spades. The game's graphics are amazing, and really shine on the AOC Agon AG352UCG’s large and high-resolution screen, while the wide aspect ratio gives you an immersive view of the battle field and the carnage that surrounds you. The wide aspect ratio also gives you an advantage while playing, as you’re able to spot enemies that you might not otherwise. Battlefield 1, like many modern games, correctly identified the unusual aspect ratio, and configured the interface and game’s graphics accordingly. Pre-rendered cut-scenes remain the same aspect ratio, however, so you will get black bars down either side of the screen while these play – this also happens if you watch movies full-screen. It's a small price to pay for such an immersive playing experience, and thanks to the G-Sync features, along with the wide aspect ratio, this monitor can really give you a competitive edge when playing games. The AOC Agon AG352UCG also has fantastic viewing angles, so if you use it to watch films with friends, or have people crowd around it while you play, then pretty much everyone will get a great view. An anti-glare coating on the screen does a brilliant job of preventing reflections from appearing without compromising image quality. There's also a low blue light setting, which is designed to help you work at night without straining your eyes or impacting your ability to get to sleep. 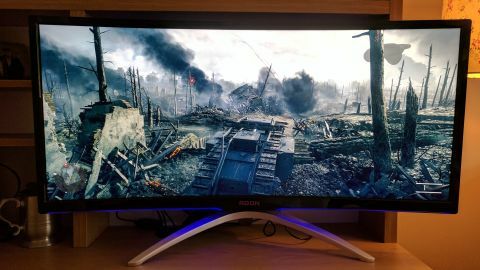 Returning to Battlefield 1, it’s an excellent game to show off the AOC Agon AG352UCG’s color handling. A wide range of different environments and colors are featured, and each one – from deep green forests to the brown, hellish landscape of no-man’s land and the poppy-strewn fields of the new They Shall Not Pass expansion – is displayed brilliantly. There was no noticeable input lag during our games, with the AOC Agon AG352UCG’s G-Sync working with a GTX 1080 GPU to offer an incredibly immersive and responsive experience. The high resolution and ultra-wide design also worked brilliantly in Windows 10, with the extra screen space giving you plenty of room to have multiple windows and programs open at once, making this a great monitor for productivity as well as for games. If you’ve got the desk space, a powerful graphics card and the requisite bank balance, the AOC Agon AG352UCG is an excellent investment for gamers. It’s a huge monitor that will fill your field of vision, and if you love being fully immersed in your games then it's well worth considering. It’s also a damn good monitor when you’re not gaming, with the high 3440 x 1440 resolution giving you plenty of space when using your PC for work. However, it’s when playing games that the AOC Agon AG352UCG truly shines, with great color reproduction, fast response times and smooth frame-rates curtesy of G-Sync. Of course, to make use of G-Sync you need a compatible Nvidia graphics card; however, even if you can't access that feature there’s still a lot to like about this excellent gaming monitor.